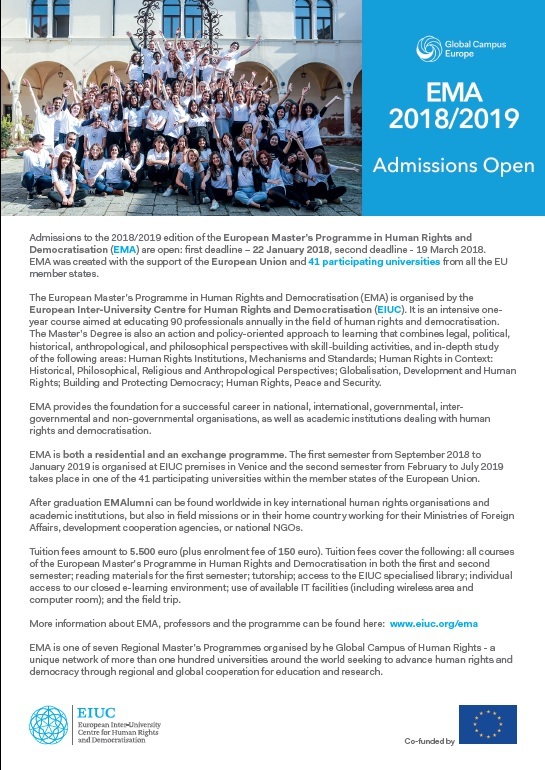 Admissions to the 2018/2019 edition of the European Master’s Programme in Human Rights and Democratisation (EMA) are open: first deadline – 22 January 2018, second deadline - 19 March 2018. EMA was created with the support of the European Union and 41 participating universities from all the EU member states. 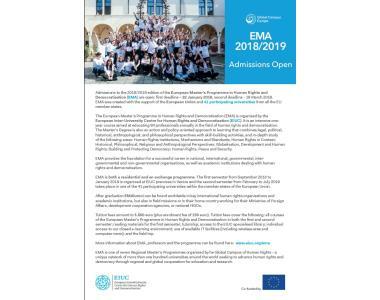 The European Master’s Programme in Human Rights and Democratisation (EMA) is organised by the European Inter-University Centre for Human Rights and Democratisation (EIUC). It is an intensive one-year course aimed at educating 90 professionals annually in the field of human rights and democratisation. The Master’s Degree is also an action and policy-oriented approach to learning that combines legal, political, historical, anthropological, and philosophical perspectives with skill-building activities, and in-depth study of the following areas: Human Rights Institutions, Mechanisms and Standards; Human Rights in Context: Historical, Philosophical, Religious and Anthropological Perspectives; Globalisation, Development and Human Rights; Building and Protecting Democracy; Human Rights, Peace and Security. EMA is both a residential and an exchange programme. The first semester from September 2018 to January 2019 is organised at EIUC premises in Venice and the second semester from February to July 2019 takes place in one of the 41 participating universities within the member states of the European Union. 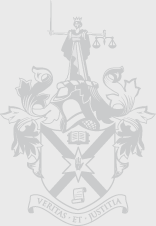 EMA is one of seven Regional Master’s Programmes organised by he Global Campus of Human Rights - a unique network of more than one hundred universities around the world seeking to advance human rights and democracy through regional and global cooperation for education and research.